Want to add a twist giving a book report? 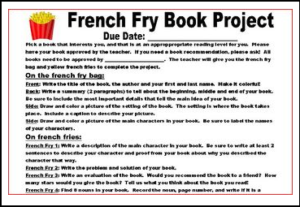 Try using the French Fry Book Project! Students create French Fry bags with various story elements and a summary, and use yellow strips of paper (french fries) to complete the other project requirements. This is a cute project that can allow all the children in your room to be successful, and read a book on their level. You get the project description with a parent notification signature, and the project rubric. When you open the document it may look like it is missing a few lines. When you print the document, or zoom in, they will appear. Project is on one printable page, but the thumbnails are zoomed and in two slides to be able to read text.